SpaceX President Gwynne Shotwell was making the rounds last week in Washington, D.C., speaking before the Satellite 2015 conference and a House Armed Services subcommittee meeting. Much of the focus was on the latter, where Shotwell engaged in a she said-he said battle over launch costs with United Launch Alliance CEO Tory Bruno. More interesting were the updates Shotwell provided on SpaceX’s plans for 2015 and beyond. What emerged is just how crowded the company’s agenda is for the rest of the year. The table below provides a summary. SpaceX is aiming for 13 orbital launches this year, including the introduction of a more powerful Falcon 9 and the debut of the 28-engine Falcon Heavy launcher. The company is also aiming to complete on-pad and in-flight abort tests for its crewed Dragon spacecraft. Thirteen orbital flights would more than double the six launches the company achieved in 2014. Through March, SpaceX has notched three successful Falcon 9 launches. Whether they get to 13 launches remains uncertain. The schedule has already suffered a hiccup, with a month-long delay in the launch of the TurkmenAlem52E/MonacoSat 1 satellite from March 21 to April 24. The problem? Helium. It’s the same issue SpaceX had last year that contributed to a reduction in the number of planned flights from 10 or 11 to six. The company had brought helium tank production in house, and things didn’t go exactly according to plan. Shotwell said that to enable the increased launch rate, SpaceX has increased production of Merlin 1-D engines. The company plans to produce 180 engines this year, 240 in 2016 and 400 the following year, she said. SpaceX will introduce an upgraded version of the Falcon 9 this summer with the launch of a satellite for SES. The upgraded booster will be about 30 percent more powerful than the current version. The extra performance will allow SpaceX to launch communications satellites to geosynchronous orbit while at the same time landing the first stage for refurbishment and reuse. SpaceX came tantalizingly close to landing a Falcon 9 first stage on a floating barge the first time out in January. It’s highly likely the company will succeed in an attempt later this year. Shotwell said the company will attempt landings on the next two Dragon commercial resupply missions, which are scheduled for April and June. Once a first stage is recovered intact, SpaceX plans to ship it to a test facility located at Spaceport America in southern New Mexico. Engineers will then put the stage through test flights to determine the limits of the hardware. 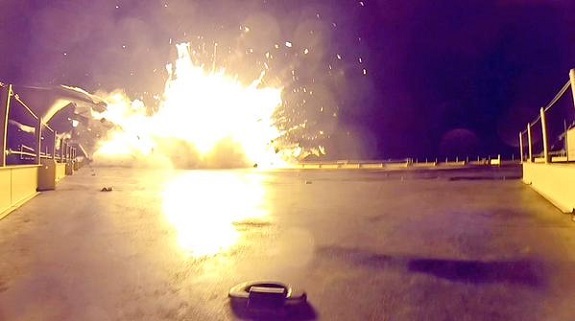 SpaceX will eventually recycle first stages for orbital launches. Future plans also include landing Falcon 9 first stages at Cape Canaveral Air Force Station and Vandenberg Air Force Base instead of on an off-shore barge. It’s not clear how soon the company will be able to attempt these milestones. Shotwell said last week that she expects certification of the Falcon 9 v1.1 booster in the first half of the year. The U.S. Air Force, which oversees the certification process, has set the same deadline. Shotwell said the Air Force certification process is going well. NASA is running its own parallel process. Certification is required for SpaceX to launch NASA’s Jason 3 ocean altimeter satellite later this year. The launch is now scheduled for July 22. Shotwell said she does not expect the upgrade t0 the booster planned for this summer to involve a lengthy new certification process. Shotwell said the Falcon Heavy will be launched from the Kennedy Space Center’s Pad 39A late this year. The pad will be ready in September or October, with a launch to follow before the end of 2015. 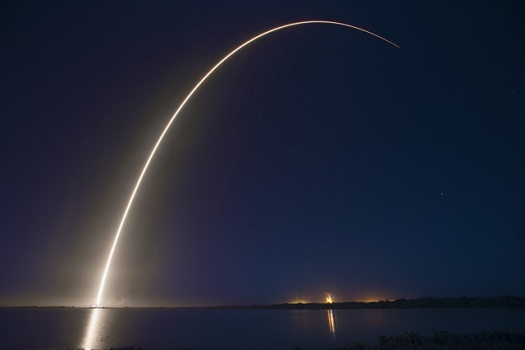 SpaceX plans to conduct government and commercial launches with it in 2016. Shotwell said the hope is to have Falcon Heavy certified for defense and NASA payloads in 2018. 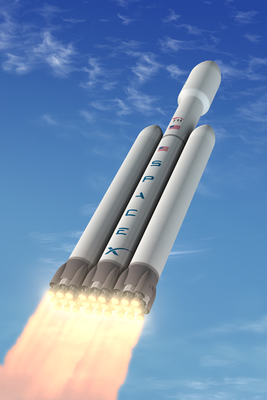 Falcon Heavy includes three Falcon 9 first stages with 27 Merlin 1-D engines clustered together with a single-engine second stage. It is designed to launch the heaviest military satellites. Shotwell said the company delayed the Falcon Heavy inaugural flight in order to focus on obtaining certification for the Falcon 9 v1.1. That focus probably accounts for some of the delay, but not all of it. SpaceX originally promised a maiden flight from Vandenberg in early 2013; now the company is projecting a launch late in 2015 from NASA’s Kennedy Space Center. The SpaceX president didn’t address the CRS2 contract, which NASA is expected to award in June. Given that all six Dragon resupply missions to the International Space Station have been successful, the company would seem to be in the pole position for winning another agreement. At least four other companies – Boeing, Lockheed Martin, Orbital ATK and Sierra Nevada Corporation – have submitted proposals for the CRS2 contract. Orbital ATK current holds the other active CRS contract. SpaceX is scheduled to complete nine commercial crew milestones this year. Two of the milestones are launch abort tests left over from the Commercial Crew Integrated Capability (CCiCap) contract. The others are for the follow-on Commercial Crew Transportation Capability (CCtCap) agreement, which was signed in September. CCtCap will culminated with a crewed flight to the International Space Station with an advanced Dragon spacecraft. 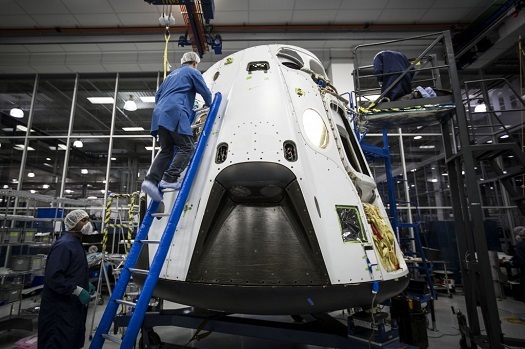 Two crewed Dragon abort tests are planned for later this year. The first test will involve a pad abort test that will take place at Cape Canaveral. The second will be an in-flight abort at Vandenberg Air Force Base in California. Shotwell said the pad abort test would be ready to go within a couple of weeks. The original plan was to conduct Falcon 9 launches on March 21 and April 10. Then the pad at Cape Canaveral would be freed up for the abort test. However, those plans have been scrambled by a month-long delay in the launch of the TurkmenAlem52E/MonacoSat 1 satellite to April 24. Both abort tests are running significantly behind schedule. The original schedule called for the pad abort test to take place in December 2013 and the in-flight abort in April 2014. 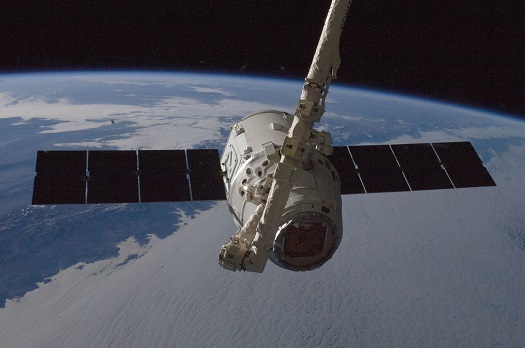 Whether SpaceX will meet all its commercial crew milestones this year remains to be seen. There appears to have been some slippage in the company’s schedule already. The list of SpaceX milestones in its CCtCap agreement with NASA has a crewed Dragon demonstration flight to ISS occurring in October 2016. However, Shotwell said last week the flight will take place in early 2017,. Shotwell also gave updates on several long-term SpaceX ventures. 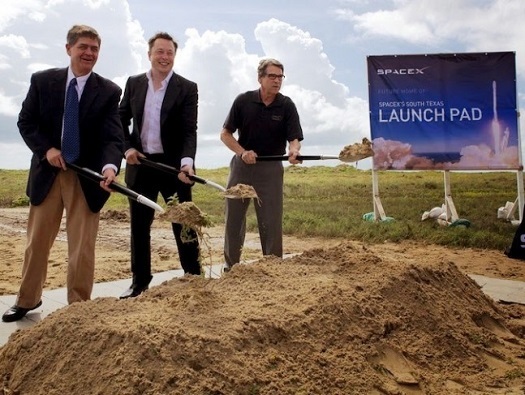 The company is building a private launch complex in Texas. Shotwell said once that facility is up and running, SpaceX will have the capability of launching 36 Falcon rockets annually. The company’s ambitious effort to provide broadband Internet to the planet via more than 4,000 small satellites is still in the exploratory phase. Shotwell said there were few additional details to provide at present. A recent $1 billion investment in SpaceX by Google and Fidelity Investments was not for the satellite Internet venture but for general business purposes, Shotwell said. Despite the recent boon in the small satellite market, SpaceX has no plans to re-introduce the Falcon 1e launch vehicle that it abandoned several years ago. Shotwell said the Falcon 9 could launch small satellites as secondary payloads. Work is continuing on SpaceX’s Mars transporter, which will use Raptor engines fueled by liquid oxygen and methane. Shotwell believes there is a commercial market for a Mars vehicle. “There are a surprising number of people who want to leave Earth,” she said. Spacex acts like a company from the 60s. So much going on and so much growth. The helium problem that is apparently caused by bringing the helium tank production in house. Is there any progress on solving that? If not, how do they plan to launch much more than last year? With politicians like Ted Cruz in charge, I’m guessing that number will skyrocket to astronomical proportions in the very near future. Hey Ted, Americans don’t want to explore space, they want to live in it. Giant firecrackers and teeny tiny capsules that never fly after 20 years just doesn’t cut it anymore. But don’t you worry, Ted, SpaceX might just offer free promotional flights in the near future on reusable boosters and large capsules that fly on regularly scheduled low earth orbit and deep space tourist flights. So don’t be the last person standing on the dock with the last boat leaves with refugees fleeing the new theocratic regime! if I understand the issue correctly, a Helium tank that was in production had failed some testing. the launch hold is to determine if the tanks that are in the rocket have the same problem. The past 3 or 4 launches have not had any delays due to the Helium system. Why do you still use a FH render in a configuration with F9 v1.0 stages? FH will feature octaweb setups, not 3×3. Excellent work Doug. Enjoyed being able to assess all the items on SpaceX’s plate in a single article. I will have one big smile on my face if they achieve all these objectives. Even though I think that may be unlikely, they are definitely moving quickly in the right direction. The old render of 3×3 on FH is not author’s fault, SpaceX hasn’t updated any materials available to media. Once Spacex takes their recovered booster off the barge. Does it go directly to New Mexico to flight test? Or do they first take it to California to dissect it? Or drop by Texas to fire the engines? What will the flight program be like? How high can they fly it at Space Port America? Will they fire only three engines or all nine on each hop? How do you best simulate a normal flight without an upper stage? Since this is normal flight booster will Musk fly it gently or hard? devert test and such? Does Musk plan to test it till he picks up the pieces? How often can you relaunch a falcon 1.1 booster? Once a month, once a week? Once a day? Heard long ago that merlins C or D are good for about 25 flights? Yes, a lot of questions. We have to move forward and look for the answers! Actually, this makes Elon Musk on SpaceX. And it turns out. So, sooner or later we will know the answers. This is not a problem for the rocket, it is a problem for a picture. As I understand it, the problem with the production of helium tank is solved. But on a rocket that was to fly in March, the tank of the old version. Although SpaceX achieved reliable operation of the old version of the tanks, it was decided to replace them. 100km up. They can only go 10km downrange. Three. There will be no second stage or payload weighing the rocket down, so all nine would be too much power. You can’t, but that’s ok because they are only testing the ability for it to fly back to the launch pad, and to do it over and over again quickly. Yes. This will be very useful for determining the right margins to have on the equipment. It will also likely reduce the cost of insurance the customers have to pay. No one knows yet. That’s what the NM testing is for. The Merlin D is good for “40 cycles”, according to Shotwell. She did not elaborate on what a “cycle” was. It was later elaborated that after the engine has flown 40 cycles the parts that undergo a lot of thermal stress could be replaced and the engine would be good for another life. here is one with the circular layout. If they land before 13th. That will sure put the attention on ULA’s future Methane Rocket Speech. I think 40 cycles was a “fairly confident estimated lower limit” – but it could be slightly less or it could be lots more. I think a cycle is a start and shutdown. So, a typical launch and return might involve 3-4 cycles. Basically they’re saying 10 launches give or take – at least in the case of the centre engine. Also, I think replacement of the thermally stressed parts was mentioned in such a way as to suggest that it might be necessary, but that only flight (i.e. launch and return) experience will tell for sure. Every single engine gets hot fired before integration into a stage (1) and every Stage gets hot fired before it is shipped to the launch site (2). At the launch site the first stage gets another hot fire test even if it is only a short duration one (3). So every first stage Engine already has 3 “cycles” on it before it even launches. Launch adds the 4th cycle, three engines make the supersonic retro-propulsion maneuver (5) and the center engine performs the actual landing (6). So unless they have changed their testing procedures, every engine will have at least 4 cycles after a launch and the center engine even 6. But all this is speculation unless somebody clarifies what exactly a “cycle” is . 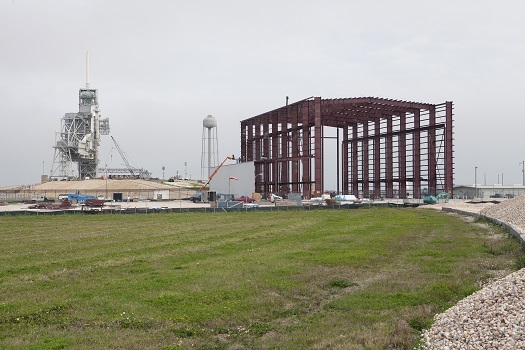 Judging from the current state of Pad 39A at KSC I find it hard to believe we will see the first FH launch in 2015. I would bet my money on it slipping into 2016. So more like 7-8 flights before 1 or more engines might need to be swapped out. Of course, since they have the engines (not at the bottom of the ocean), then swapped out engines could be returned to the factory for refurbishment. I do not understand only one question. Why, I do not understand? If SpaceX asked for the contract, It probably would be got it. Without offering its services SpaceX practically himself gave up contract. How Come? Remmenber this is the same Guy that gave away all his Tesla patents away to hurry the electric car so he can sell more batteries. Takes more them one company to make commercial space possible. NASA seed money must be spread around!